As we spend more and more time online the need to secure and enforce your own privacy is rising. We are tracked by Facebook, Google and just about every website that we visit. The number one identifier is your IP-address and in this article you will learn how to hide your real IP-address. Your IP-address is one of the easiest ways for a website to get info about you. An IP-address is a unique number that your computer, smartphone, tablet and so forth will inherit from your Internet Provider once you connect to the Internet. This number is needed for your device to send and receive data – in other words without an IP you can’t get online, and at the same time it is the IP that prevents your from staying anonymous. The thing about IP addresses is that they are easy to trace. Just look at the top of this page – here I have used a script to track your IP-address and look up your location. Once a website knows your IP and location they will be able to track you even if you clear out cookies on your computer. So in order to surf anonymously you need to change your IP-address. The way to do that is to connect to a Virtual Private Network also known as VPN. Connection to such a network will enable you to hide behind a server that will act as a middleman between you and any website or service that you connect to. Personally I prefer using Unlocator as it gives me the ability to change location in an instant. Once signed up to Unlocator you get access to 234 servers located in 42 countries – plenty to choose from. For PC and Mac they have made an app that makes it really easy to switch location by the click of a button. You can also use the service on mobile devices such as an iPhone, iPad or Android phone. Basically Unlocator makes it really easy to surf anonymously and you don’t have to be a nerd to make it work. 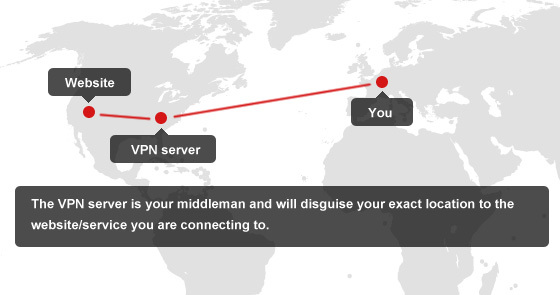 Basically a VPN connection will not only secure your data traffic, but it will also hide your real location and help you stay anonymous. Not an easy task in this day an age of the Internet.